This title was first published in 2002: JÃ¶rg Breu belonged to the generation of German Renaissance artists that included DÃ¼rer, Cranach, GrÃ¼newald, Altdorfer, and, in his own city of Augsburg, Hans Burgkmair the Elder. His art registered the early reception of Italian art in Germany and spanned the dramatic years of the Reformation in Augsburg, when the city was riven with social and religious tensions. Uniquely, for a German artist, Breu left a diary chronicling his reaction to the massive social and cultural forces that engulfed him, including his own conversion to the Protestant cause. His story is representative of the condition of many artists during the Reformation years living through this watershed between two cultural eras, which witnessed the transfer of creative energies from religious painting to secular and applied forms of art. 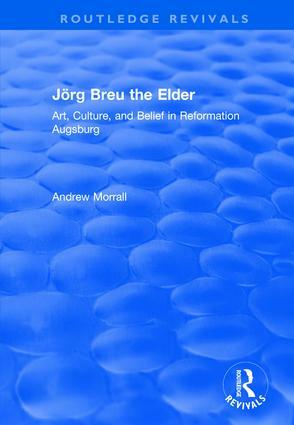 In this wide ranging and original study, Andrew Morrall examines the effect of these events on the nature and practice of JÃ¶rg Breu's art and its reception, not just in his own period, but right up to the present day. Contents: Introduction: The Artist's Smile; 1: The Artist and His Workshop, c.1498-c.1517; Beginnings: The Austrian altarpieces; Economic background; Work in fresco; Panel painting: style and patronage; The artist as designer; Woodcuts; Designs for sculpture; Designs for glass; The drawings for the Months of the Year; Painters, glaziers and glass-paintings; 2: The Turn Towards Italy; Augsburg and the South; The Aufhausen Madonna; The Prayerbook of Maximilian I; Image and verse; The frescoes for the Augsburg town hall; The organ shutters of the Fugger Chapel in St Anna, Augsburg; The large wings; The trip to Italy; The small organ shutters; Style and dating; 3: Breu and the Reformation;The course of the Reformation in Augsburg; The Reformation and the arts; The Chronicle; Breu's Protestantism: A case study in Reformation piety; Painting in the Reformation; Woodcut illustrations; The soldier as Unrepentant Thief; Garlic, the Jews and 'the sleep of ignorance': St Thomas as exemplar of faith: humanist responses to the Reformation and the origins of the Emblem; the St Ursula alterpiece: iconoclasm and the image question; Breu and Zwinglianism; The Holy Works of Mercy; 4: The Deutsch and the Welsch. Neo-Classicism and its Uses; Conclusion; Appendix. Hand-list of surviving or recorded designs for glass and glass-roundel designs; Index.